© 2002, © 2018 by Paul Freeman. Revised 9/9/18. 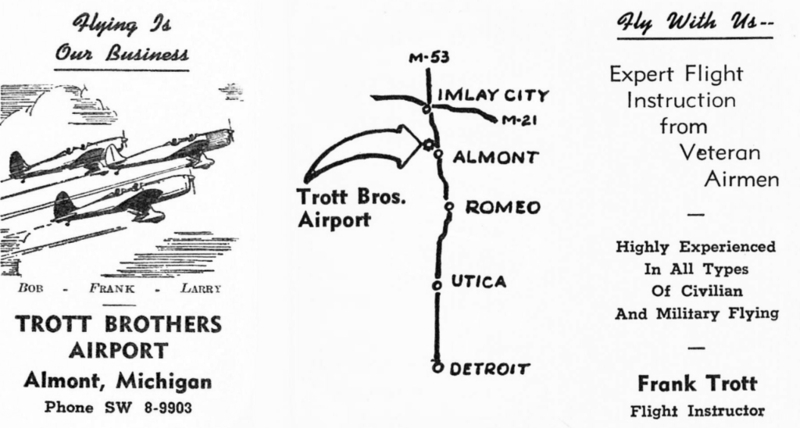 Baker Airport, as depicted on the October 1943 Detroit Sectional Chart. Photo of the airport while in use is not available. 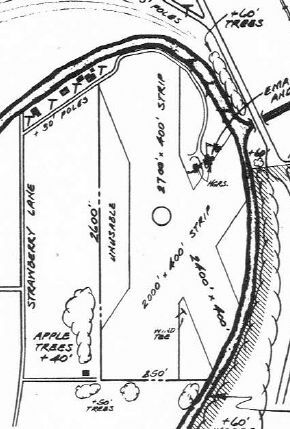 as it was not yet depicted on the April 1940 Detroit Sectional Chart. 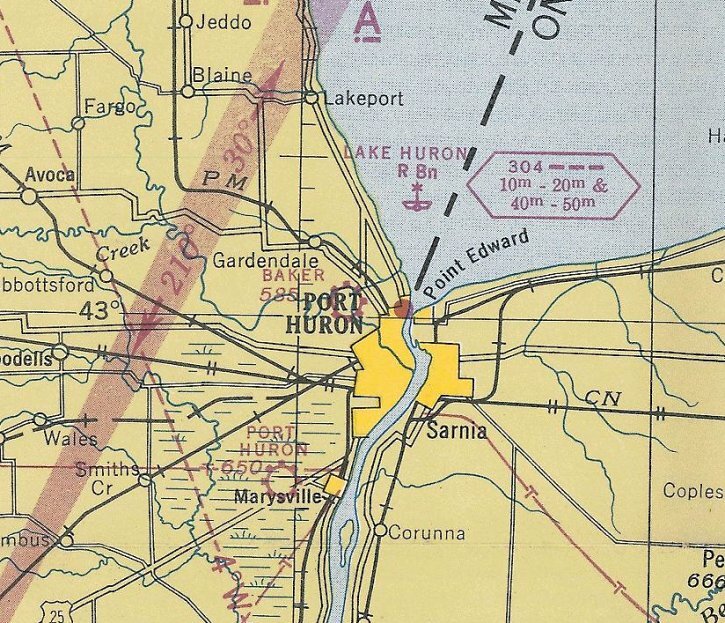 The earliest depiction which has been located of Baker Airport was on the October 1943 Detroit Sectional Chart. 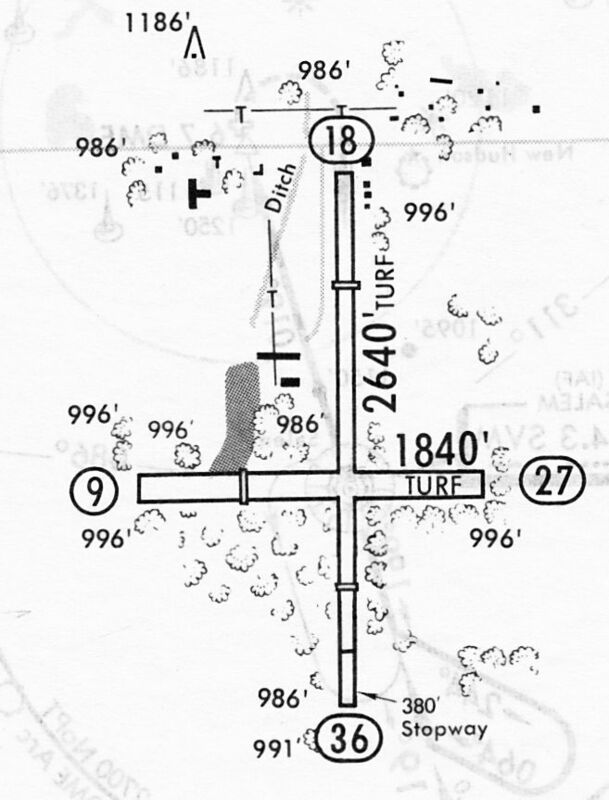 The 1947 MI Airport Directory (courtesy of Mike Denja) depicted Baker Airport as having 3 unpaved runways, with the longest being the 2,700' north/south strip. A few small hangars were depicted on the northeast side. 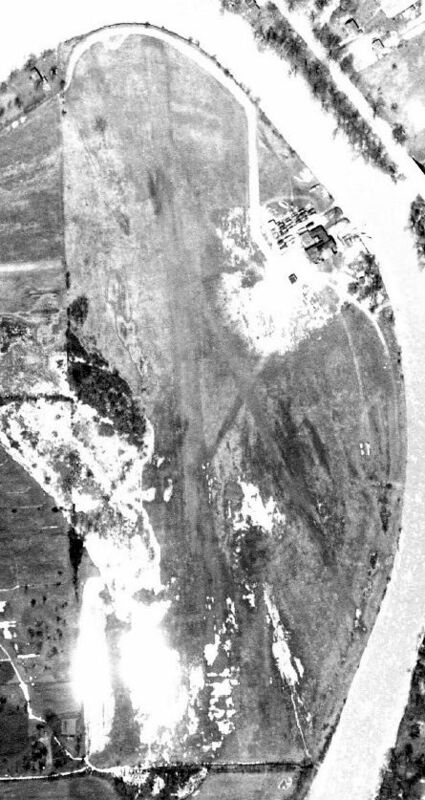 The earliest photo which has been located of Baker Airport was in a 1958 aerial view. It depicted several light single-engine aircraft parked next to the hangar on the northeast side. with the northeast/southwest runway presumably having been abandoned at some point between 1947-61. Three small buildings were depicted on the northeast & east sides. 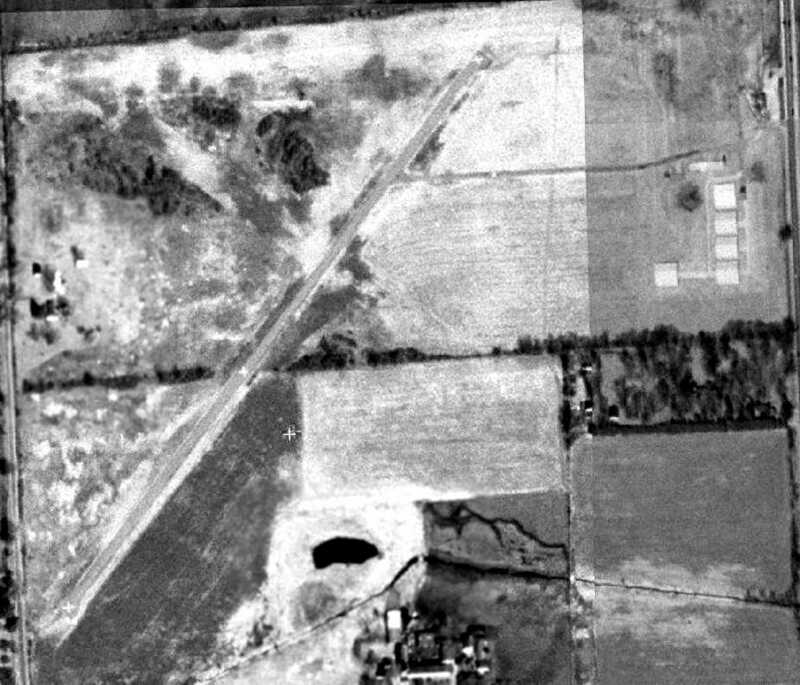 The earliest photo which is available of Baker Airport was a 1961 aerial view (courtesy of Mike Denja). It depicted the field as having 2 unpaved runways. No aircraft were visible on the field, but a number of boats were apparently stored on the field around the buildings on the northeast side. 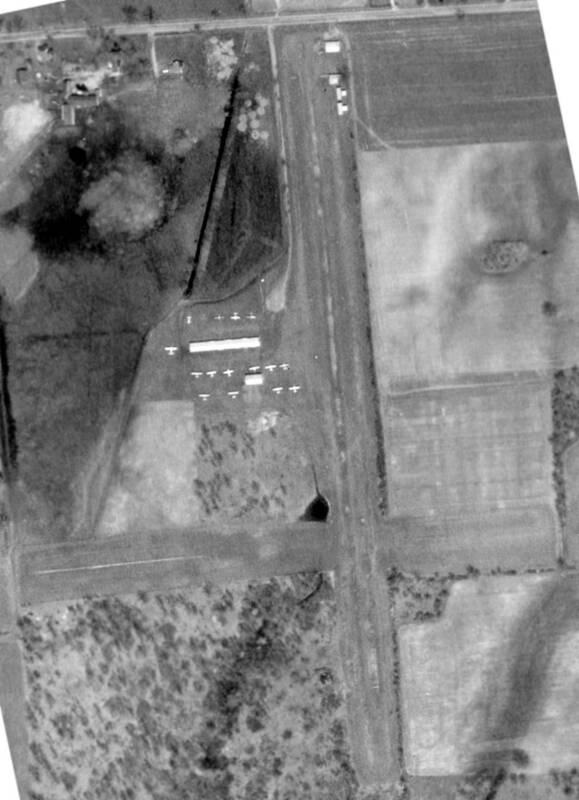 The last photo which has been located showing aircraft at Baker Airport was in a 1964 aerial view. was on the May 1977 Detroit Sectional Chart (courtesy of Mitchell Hymowitz). It depicted Baker Airport as having a 2,500' unpaved runway. and no aircraft were visible. 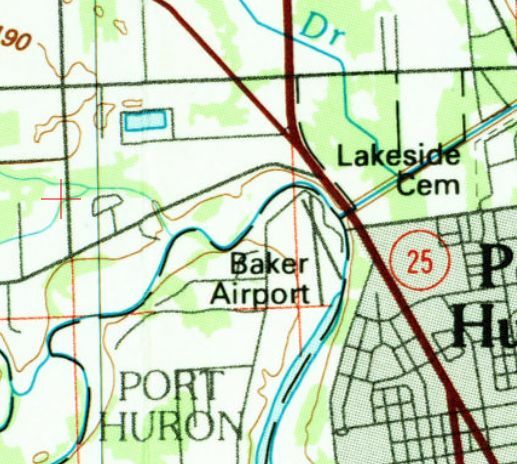 The last labeled map depiction which has been located of Baker Airport was on the 1990 USGS topo map. It depicted Baker Airport as having 2 runways. 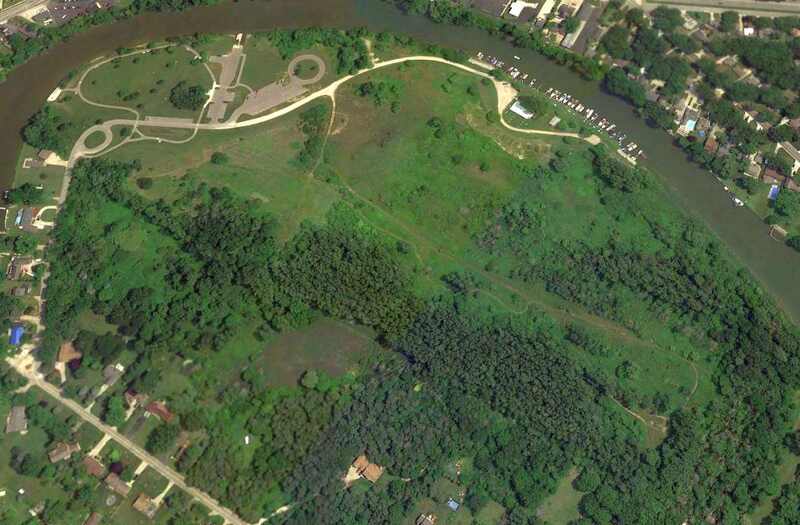 as a 1998 MI DNR aerial view (courtesy of Mike Denja) showed roads & paths having been built over the site. The orientation of the north/south runway was only barely recognizable, but the hangars had been removed. 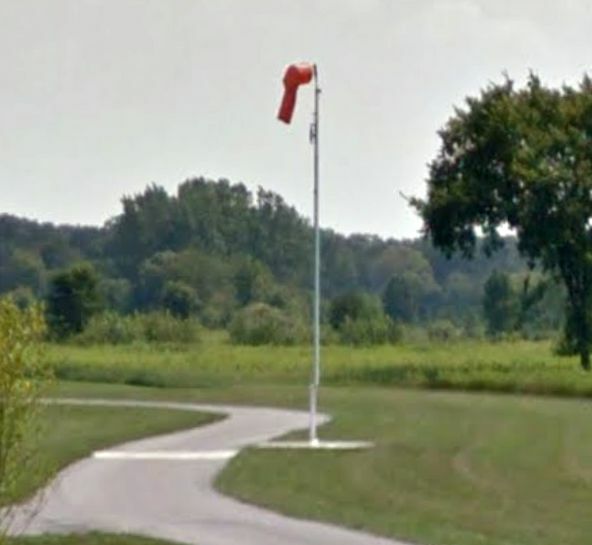 An August 2013 photo looking southeast (courtesy of Mike Denja) shows the last remaining trace at the site of Baker Airport – its windsock has been preserved by the park which occupies the site. 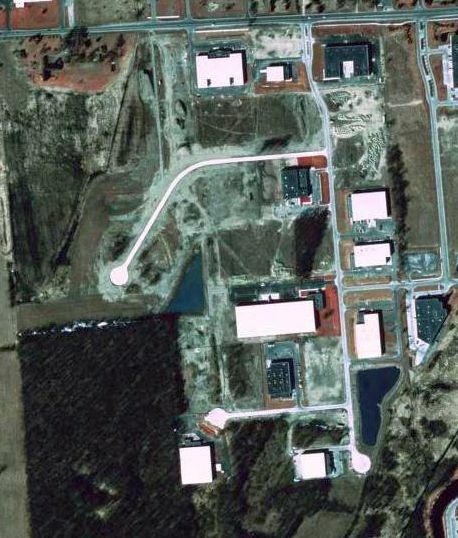 A 2015 aerial view looking northeast showed more roads & parking lots had been built over the site of Baker Airport. 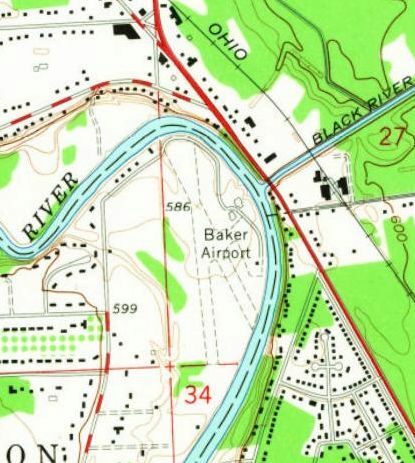 As of 2015, street maps label the site of Baker Airport as Bakers Field Park. The site of Baker Airport is located at the northeast end of Strawberry Lane. 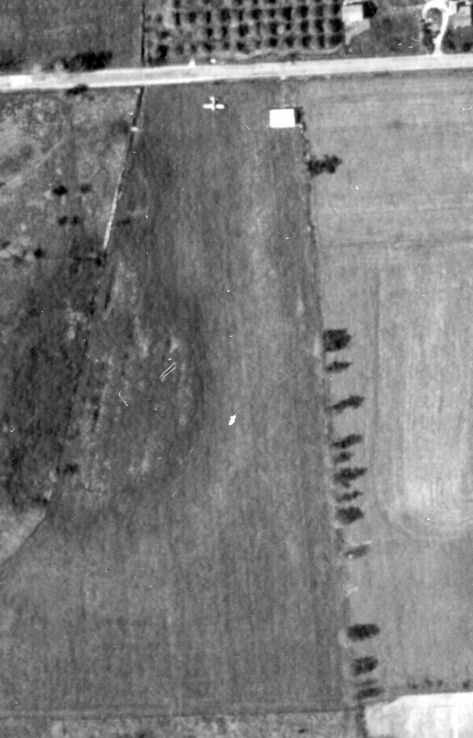 A 1949 aerial view of Spencer Airport (courtesy of Mike Denja) showed 1 single-engine plane on the north end of a north/south grass runway, next to one small building. as it was not yet depicted on the 1945 USGS topo map nor listed in the 1947 MI Airport Directory (according to Mike Denja). 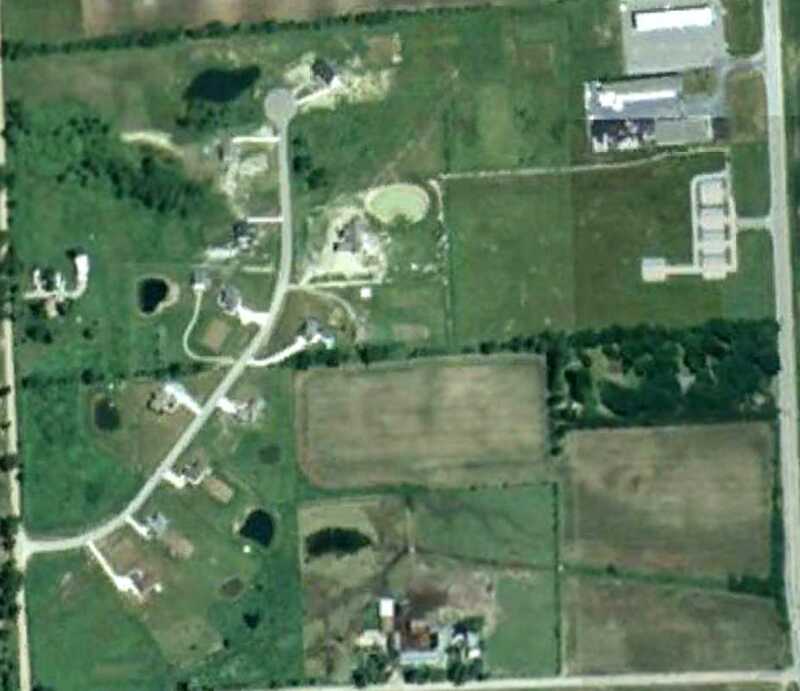 which showed 1 single-engine plane on the north end of a north/south grass runway, next to one small building. 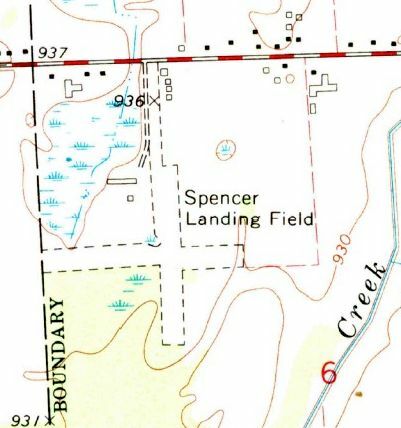 Spencer Airport was founded by Vern Spencer on his home property (according to his obituary, courtesy of Mike Denja). Spencer was a founder of the MI Flying Farmers. as having a single unpaved north/south runway with 1 small building on the northeast side. had gained a 2nd small hangar on the northeast side at some point between 1-54-56.
as shown on a 1967 aerial view (courtesy of Mike Denja). This photo also showed the small airport at perhaps its zenith of popularity, with 13 light aircraft visible on the field. as having 2 unpaved runways & 6 small building on the northwest & northeast sides. Spencer Airport was operated by its founder Vern Spencer until his death in 1971 (according to his obituary, courtesy of Mike Denja). It depicted Spencer Airport as having a 2,600' unpaved runway. was on a 12/2/83 airport directory (courtesy of John Kielhofer). It depicted Spencer Airport as having 2 unpaved turf runways: 2,640' Runway 18/36 & 1,840' Runway 9/27. Two small buildings were depicted northwest of the runway intersection. and a cul-de-sac for a new street had been built over the southern end of the north/south runway. with all traces of the former airport having been erased by new construction. 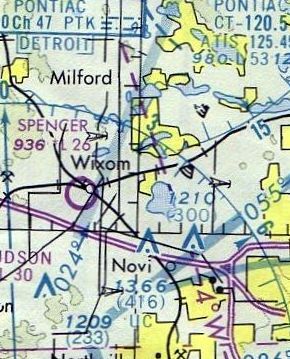 The site of Spencer Airport is located south of the intersection of Century Drive & West Pontiac Trail. 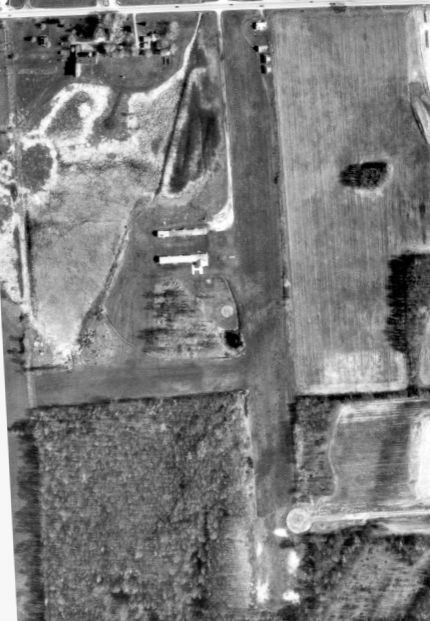 Almont Airport, as depicted on a 5/1/67 USGS aerial photo. on the family farm after their dad purchased the land. 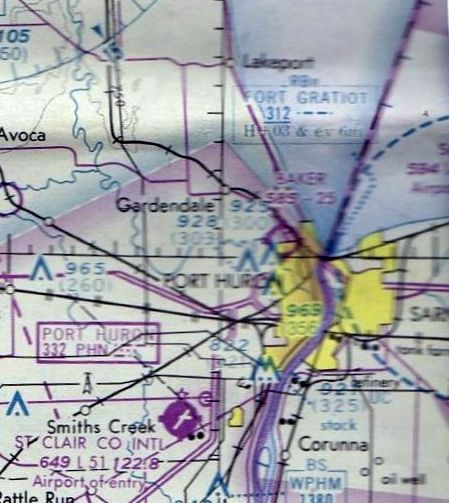 described Almont Airport as a private field having 2 unpaved runways, measuring 2,500 northeast/southwest & 1,800' northwest/southeast. The Trott brothers operated the airport until 1952, when it was leased. served as a pilot for the Ligon Brothers business aircraft based at Trott Brothers Airport. which depicted it as having 2 grass runways, with a few small buildings & 2 single-engine planes on the east side. An undated business card for Trott Brothers Airport (courtesy of Frank Trott’s daughters, via Mark Cryderman). Mark Cryderman reported, “Almont Airport brings special memories. It was owned by my cousins, the Trotts, whose farm can be seen at the west end. My father taught me to love aviation & he was taught to fly, at this airport, by cousin Frank Trott. Frank had a 4 digit pilot's license, taught bomber pilots during WW2 & flew DC-3s for Republic Airlines. as having 2 unpaved runways, with 4 small buildings on the east side. 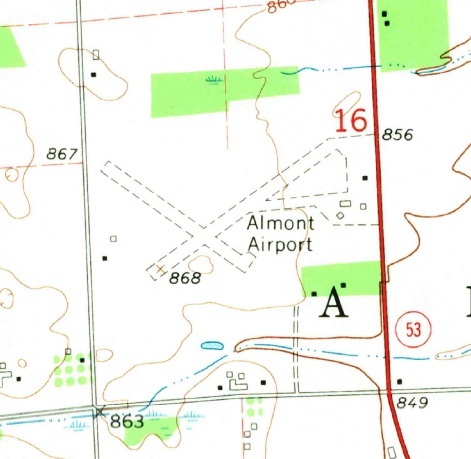 It depicted Almont Airport as having a 2,300' paved runway. 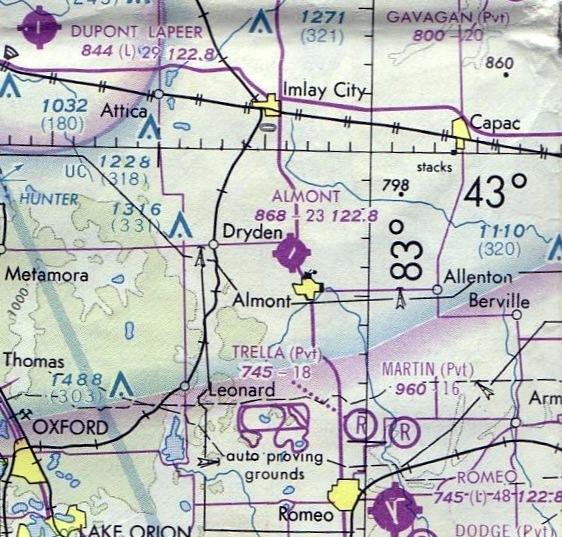 The 1983 USGS topo map depicted the Almont “Municipal Airport” as having a single northeast/southwest runway. and used to be a center for ultralights in the 1980s. as having a single paved northeast/southwest runway, along with 2 unpaved runways. A taxiway led to several small buildings (hangars?) along the east side. 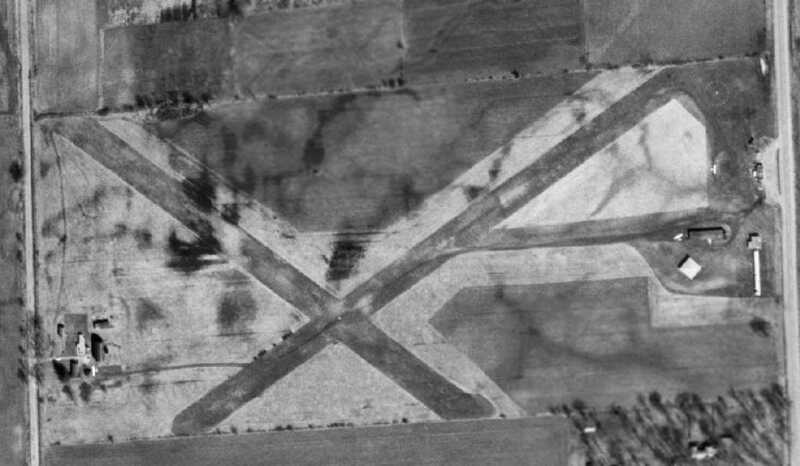 as the 3/28/99 USGS aerial photo depicted the paved runway as being marked with 3 closed-runway “X” symbols. The airfield otherwise remained intact. 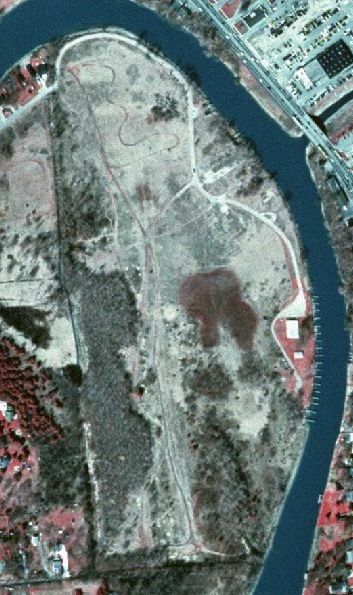 as shown in a 2006 aerial view, but the northeast portion of the runway remained recognizable. The hangars appeared to remain intact on the east side of the field. A circa 2006-2010 photo (courtesy of M. Hoshaw) looking west at the former hangars, now reused as “Almont Airport Storage”. 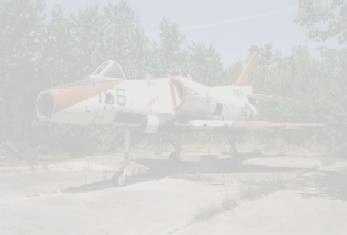 M. Hoshaw reported in 2011, “Almont Airport... If you drive by it on Van Dyke (in Michigan) you can still see the hangars. 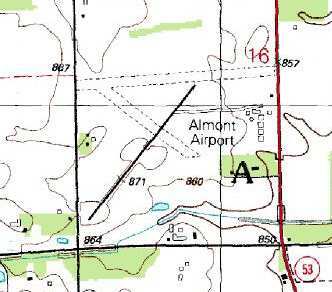 The site of Almont Airport is located northeast of the intersection of Tubspring Road & Shoemaker Road.